From the perspective of us A-listers (sorry, couldn’t resist), that would amount to a classic case of the kind of “tyranny of the majority” our Founding Fathers were so eager to avoid, illustrating why certain filters, or brakes, on direct democracy are desirable. The idea was that people shouldn’t legislate themselves, but instead leave that up to their representatives. And even if the people’s representatives get carried away, our political system has other checks and balances to insulate it from too much democracy: Congress itself is split into two bodies; unelected judges protect the Constitution from lawmakers; our nation’s monetary policy is set by an “independent” (undemocratic, that is) Federal Reserve Board. We’ve also developed a stable of technocratic agencies like the Food and Drug Administration and the Federal Communications Commission to govern areas of American life at a dotted-line remove from the democratic process. All these checks on democracy, together, constitute the genius of American democracy. We pride ourselves on our freedom to do as we damned please, but at the same time we’ve locked away all the chocolate and given the key to a friend, and warned him not to listen to us if we call to ask for it urgently late some night. Of course we then complain about how the system doesn’t work, about how we can’t binge on chocolate whenever we want. Such complaints are the fuel of the term “populism.” The word wasn’t current in the era of the Founders, and it remains vaguely defined in ours, but it’s precisely what our republic’s designers were intent on protecting against: The danger that over-indulging majority passions could overwhelm and subvert the system at any given moment. This is the election year of mad-as-hell-and-not-going-to-take-it-anymore populism (to cite the Howard Beale character from the classic Network movie), with Bernie Sanders and Donald Trump railing against how bankers, Washington, the Federal Reserve, foreigners, and conspiring elites are holding back “the people.” Those are familiar rants, yet, there is something novel about the threat posed by today’s populism: The real threat nowadays is a potential tyranny of an agitated minority, more so than a potential tyranny of the majority. The two dangers are easy to confuse because agitated minorities can look very much like a majority now that they can mobilize via once unimaginable communications technology and dominate wall-to-wall cable TV news coverage. Who knows how far William Jennings Bryan or Eugene V. Debs would have gotten with a Twitter following, a YouTube channel, and the ability to call into CNN? Let’s tweak our imagined tax referendum to illustrate what a tyranny of the minority looks like. Suppose that instead of asking Americans whether people whose first name starts with an A should pay more taxes, we ask them to vote on whether A-listers should be exempted from ever again having to pay any taxes. This measure, if uncoupled from any other balloting in a low-turnout vote, might conceivably pass. Why? Because we A-listers would turn out to vote in droves, and most everyone else would have little incentive to vote, or to speak out against the measure. The real threat nowadays is a potential tyranny of an agitated minority, more so than a potential tyranny of the majority. It’s an extreme hypothetical, but too much of American political life has become vulnerable to hijacking by intensely motivated and agitated minorities. It’s why teachers unions can control school board elections, why the gun lobby can punch above its weight in Washington, and why we haven’t fixed our broken immigration system. The danger of not appreciating the threat posed by an extremely motivated minority, as opposed to an untrammeled majority, is that our society is enabling the former threat with its overzealous vigilance against the latter. So, for instance, while a bicameral Congress and the separation of powers that allots the executive a veto and the courts judicial review are good brakes on majority rule, the Senate’s filibuster rules and the so-called “Hastert Rule” observed by House Republicans go too far in empowering agitating minorities. The Senate’s longtime filibuster rules were infamous in delaying the adoption of needed civil rights in the 20th century, long after a majority of Americans were ready to go along. This was a case of an aggrieved minority—white Southern Democrats—subverting the will of the majority to protect said minority. The Hastert Rule in the House is a more recent, and less formalized, tradition in the House of Representatives that has similarly served to block immigration reform favored by a majority of Americans, and by a majority of their representatives in Congress. The policy, enunciated by Dennis Hastert when he was the Republican Speaker of the House (long before he was revealed to be a child molester), and loosely followed by some predecessors and successors, is that proposed legislation should not be brought for a vote on the floor of the House unless it is supported by a majority of the party’s own caucus. As speaker in recent years, John Boehner set aside the rule at key times to allow for bipartisan votes to keep the government open when some far-right Republicans were threatening to close it down, and that’s one reason Mr. Boehner is no longer in office. But he did not allow the House to vote on a sensible immigration reform bill passed by the Senate in 2013, which would have legalized the status of the millions of undocumented workers in this country. The bill could have passed in the House with the support of Democrats and more moderate Republicans (as it did in the Senate), but the Hastert Rule stood in the way. The Founding Fathers intended for both chambers of the Congress, as well as the president and the judiciary, to all wrestle with thorny issues like immigration—balancing the will of the people with the Constitution. It’s a perversion of their design for one faction within the House to hijack the process, and allow for an agitated minority of anti-immigration nativists to become the arbiters of what constitutes a proposal worth voting on. Immigration and international trade feature prominently in this election cycle’s populist discourse, but it’s inaccurate to portray these issues, as the media often does, as pitting elites against “the people.” Opinion polls consistently show that a majority of Americans view trade in a positive light and favor immigration reform along the lines of what the Senate passed three years ago (as opposed to mass deportations and a wall). It’s easy to lose track of that reality, though, given the asymmetry of passion and interest between supporters and opponents of immigration and free trade. Richard Nixon’s odes to the concept of a “silent majority,” whose support he cherished, were often mocked by pundits in his day but it’s a concept worth revisiting. Today there is a silent majority that thinks it’d be insane to deport millions of hard-working, law-abiding immigrant workers. But, like many other insane ideas out there, this one isn’t going to keep most people from going about their daily business. It’s the supporters of the insanity who likely consider immigration THE ISSUE of our times, and can be found screaming at rallies and pestering their members of Congress, threatening to have them “primaried” if they work with Democrats on the issue. The dangers posed by agitated minorities are not merely an American phenomenon. They are wreaking greater havoc in other western democracies, like Colombia and Britain, that have ill-advisedly put big questions to a public vote in 2016. Elites in London and Bogotá were seeking additional legitimacy for their decisions to stay in the European Union and reach a final peace settlement with a vanquished narco-insurgency by engaging their silent majorities in the process. In the end, sizable impassioned minorities prevailed. 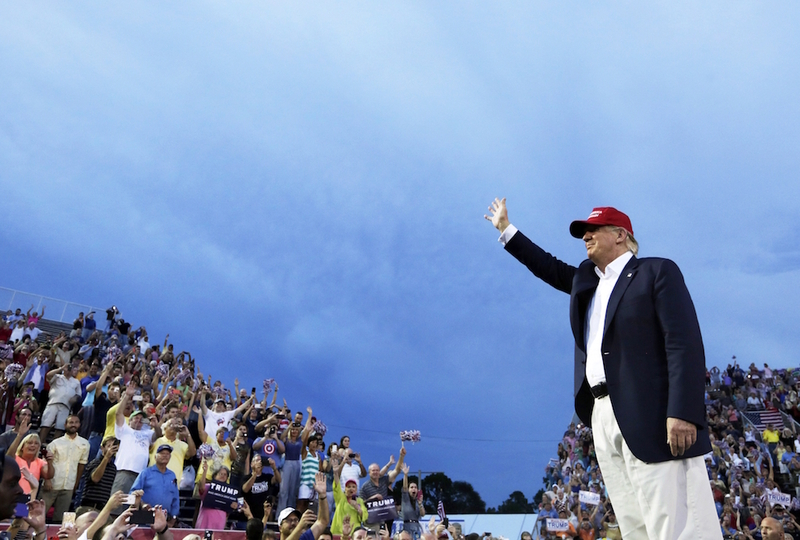 Trump’s populist campaign narrative of elites pitted against “the people” is off. Today’s politics is pitting elites and a silent (or quieter) majority against a loud, angry, mobilized faction of people susceptible to a populist pitch. The question on November 8 is whether the silent majority makes itself heard, or whether it will cede the electoral battleground to the more clamorous minority. Andrés Martinez is the executive editor of Zócalo Public Square. *Photo by Brynn Anderson/Associated Press.